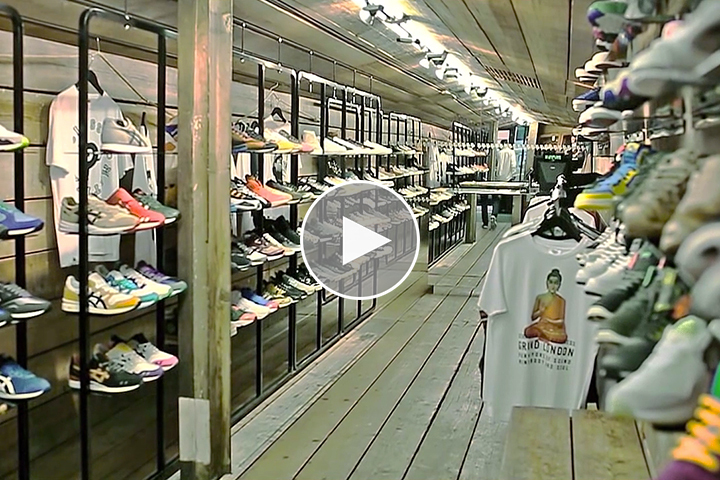 Australian blogger and filmmaker Lester Jones presents this short insight into London store Footpatrol as part of his ‘Behind The Brand’ series. Lester sits down with Footpatrol’s Operations Manager Jimmy ‘The Hitman‘ Horrocks who you’ll likely have met yourself if you’ve ever visited London’s legendary sneaker store. Jimmy talks about what Footpatrol represents, their customers and the product you’ll find inside the store – all of it carrying their ethos of ‘enjoying what they do and putting out consistently good product’. The conversation also touches on Footpatrol’s brand as a whole, outside of the store itself, with their collaborative project and hints at what you can expect from FP in 2014. It’s really great to see a piece like this produced purely from the love and enthusiasm for sneakers and recognising the hard work that Footpatrol put in. Lester is a very talented guy and has produced a lot of other great films you can see on vimeo. Stop by the store at 80 Berwick Street next time you’re in London and check it out for yourself if you haven’t already. You can also keep up to date with Lester’s movements at I Dig Your Sole Man. Whats behind the brand? Really? Props for a great video etc but they really didn’t get ‘Behind the brand’ did they? Behind the brand lays JD sports who’s dressing up ‘owning’ the entire UK sneaker trade by using a once reputable independent retailer store front to do so. Im so glad that they have the millions and obviously the right people to complete the look while brands continue to queue up for Size? and Foot Patrol exclusives.